Hillary Clinton had a 100K lead in early voting in Harris County, and increased her lead as the night went on. The only countywide Republican who was leading early on was Mike Sullivan, but later in the evening, at the time when 80% of the Election Day vote was in, Ann Harris Bennett caught and passed him. Kim Ogg and Ed Gonzalez won easily, Vince Ryan was re-elected easily, and all Democratic judicial candidates won. The HISD recapture referendum went down big, the Heights referendum to update the dry ordinance won, and Anne Sung will face John Luman in a runoff for HISD VII. Statewide, Clinton was trailing by about nine points, and with a ton of precincts still out was already at President Obama’s vote level from 2012. Dems appear to have picked up several State House seats, though not the SBOE seat or CD23. Clinton also carried Fort Bend County, though she had no coattails, and Commissioner Richard Morrison unfortunately lost. I’m too stunned by what happened nationally to have anything else to say at this time. I’ll be back when I recover. For an issue that directly affects a few thousand people, this sure had gotten a lot of attention. [Bill] Baldwin is part of the “Keep the Heights Dry” movement, a group of individuals urging residents who live in the dry part of the Heights to vote against the city of Houston proposition that would allow the legal sale of beer and wine for off-premise consumption. If the proposition passes on Nov. 8, retailers like convenience and grocery stores would be able to sell beer and wine in a part of the Heights that has been dry since 1904. The change would not affect restaurants, which are able to sell alcohol by forming private clubs that their customers can join by providing their driver’s licenses. Baldwin’s group is going up against the Houston Heights Beverage Coalition, a political action committee formed earlier this year to push the reversal of the dry law. Largely at stake is the proposed development of a new H-E-B on a former Fiesta site at 2300 N. Shepherd. H-E-B wants to buy the property but said it needs to be able to sell wine and beer in order for the store to be economically feasible. “From a business proposition, if I spend $25 or $30 million building a store I also need to make sure it can earn a fair return,” said Scott McClelland, Houston division president for H-E-B. The San Antonio-based grocer has put more than $60,000 into the coalition, according to finance reports filed with the Texas Ethics Commission. Baldwin, who lives in the Heights but outside the dry area, said the election is not about being against H-E-B but preserving the character of the neighborhood. His group has been urging residents of the dry area to consider the issue apart from H-E-B. He said more service stations and convenience stores could diminish property values of the homes around them. “This election is not about H-E-B, it’s about changing the fabric about my community,” Baldwin said. Honestly, there’s nothing here that you couldn’t learn from reading the dueling op-eds or listening to the interviews that I did with Baldwin and Reilley. The story did remind me that there used to a a tiny HEB – it was called an “HEB Pantry store” back in the day – in the Heights that no one went to because it didn’t have much in it. This whole debate is a little nuts because people in the greater Heights area have been begging to get a real HEB like the one in Montrose in the neighborhood, and if it weren’t for this oddball quirk of history, the announcement that there would be an HEB built on the site of the old Fiesta would be greeted with handsprings and huzzahs. But because we’re held hostage to the way some people viewed the demon rum a century ago, we’re stuck with this silly debate. Everyone in America is ready for the Presidential race to be over, I’m ready for this referendum to be settled. The Chron hosted a mini-debate about the vote to change the Heights dry ordinance on its Monday op-ed pages. Bill Baldwin represented the status quo, for keeping the Heights (the original Heights) dry. With the stark reality of land use as it is today, our deed restrictions are patchy, and most properties on high-traffic streets here are not restricted at all. In a city with no zoning, other typical neighborhoods have deed restrictions where the Heights does not. Undoubtedly, the dry area has successfully kept large operators such as Walmart, Target, Sprouts, Kroger and a Whole Foods concept on the way all outside of our historic borders. Eliminate that barrier and you make way for future big-box retailers, gas stations and convenience stores, along with their parking demands and high traffic. You don’t build a fence to keep out the good neighbors; it’s for the bad ones. In this scenario, we still consider H-E-B a good neighbor, but I am concerned about operators without the reputation of H-E-B. We don’t know exactly what will happen if we change the dry area, but we do know this: All around the city there is concern about the changing character of neighborhoods. Like the rest of the city, the Heights is wrestling with these issues of development and identity. How do we responsibly progress, increase property values and keep a sense of identity intrinsically tied to the community? In the Heights, the dry area has in many non-obvious ways functioned toward those ends. Keeping the Heights dry means also keeping it local and residential. Steve Reilley spoke for the pro-change faction, to amend the historic dry ordinance to allow beer and wine sales for off-premise consumption, i.e., retail sales. We need to alter this regulation in order to welcome locally oriented businesses into the community. Rest assured, this is a grassroots effort, and is not driven by businesses wanting to sell alcohol. More than 1,700 Heights voters signed the petition requesting the measure be placed on the Nov. 8 ballot. Our effort has been criticized because of H-E-B’s involvement. H-E-B didn’t sign the petition – we did. And the Texas Constitution gives us the right to have this election because we want to preserve our neighborhood, increase consumer options, raise property values and increase walkability, as Mayor Pro Tem Ellen Cohen, the chairwoman of the Houston City Council Quality of Life Committee, recently noted that the repeal of this regulation will do. Some have suggested that permitting the sale of beer and wine for off-premise consumption will lead to the opening of convenience stores along Heights Boulevard, negatively affecting the Heights’ character. High property costs in the area would inhibit such use. In addition, much of Heights Boulevard and most of the affected area falls within the Houston Heights East and Houston Heights South Historic Districts, which prohibits existing covered structures from being torn down and replaced with nonconforming structures, such as convenience stores. Moreover, various properties along Heights Boulevard and other parts of The Heights are subject to deed restrictions that preclude commercial use. Some opponents to the proposition have unfortunately engaged in “scare tactics” by suggesting unrealistic harm will fall upon our neighborhood if Heights-area stores are permitted to sell beer and wine for off-premise consumption. This election has nothing to do with liquor stores, bars, strip clubs or chain restaurants. It will have no impact on restaurants that operate as private clubs to serve alcoholic beverages to patrons. Residents will not be able to sell beer, wine or liquor out of their homes. This activity is already prohibited by numerous state laws, county regulations and city ordinances. I did interviews with both gentlemen about this – here’s Baldwin and here’s Reilley. The latter was done in June after the petitions were submitted and before there was any organized opposition, so that interview was more informational, since there were still a lot of questions about what this effort was and what it meant. Baldwin doesn’t really say anything in his piece that he didn’t say in the interview he did with me, while Reilley’s article necessarily includes some rebuttals of pro-dry talking points. If you are in the affected area and somehow haven’t yet decided which way to go on this referendum, the two opinion pieces and interviews should tell you all you need to know. I have no idea which side will win. I won’t be surprised by either result. There’s been a lot of recent discussion of it on the Heights Kids mailing list, with a fairly even split between the factions; the few recent threads I’ve seen on Nestdoor were all started by pro-dry people. I’ve seen more pro-dry yard signs than I have seen pro-amend signs, but I’d say half of those signs are in yards that are not in the affected area. (A good bit of the discussion I’ve seen in both places has been about who actually gets to vote on this issue.) I’m pretty sure there will continue to be a lot of chatter about this after the election, whichever way it goes. As you know, there will be a referendum on the ballot for a very limited electorate this year, to alter the existing ordinance that enforces a dry zone in the historic Houston Heights to allow the sale of beer and wine for off-premise consumption – for retailers, not for restaurants and bars, in other words. 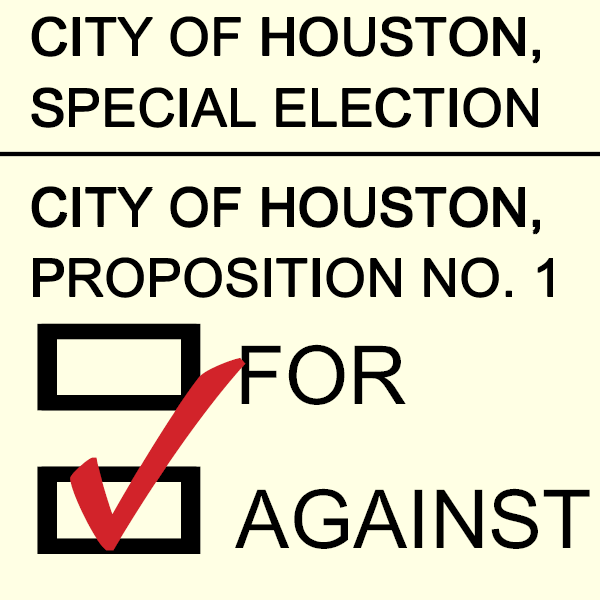 This referendum, formally known as City of Houston Proposition 1, was placed on the ballot by a petition drive led by the Houston Heights Beverage Coalition, which in turn was backed by HEB, which has announced its intention to open a store in the old Fiesta location on North Shepherd at 24th if this referendum passes. I did an interview with Steve Reilley of the HHBC back in June when petitions were still being circulated to clarify some questions about this. At the time, I noted that I was unaware of any organized opposition to this effort. Interviews and Q&As from the primaries are on my 2016 Election page. I will eventually get around to updating it to include links to fall interviews.